Add 5 quarts water to large pot, add 2 tablespoons of kosher salt; cook over high heat. When water comes to a full boil, add the spaghetti and until al dente. Note: set aside 1 cup of pasta water before straining. In a large skillet, add the pancetta; cook over medium heat until crispy, 4 to 5 minutes. Remove from pan using a slotted spoon and set aside. Add the garlic and the oil to skillet; sauté on medium-low heat until barely golden. Add 1 to 1 1/2 cups of wine to skillet with garlic. 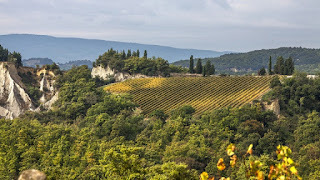 Raise heat to medium-high for 6 to 8 minutes or until wine has reduced by half. Season with salt, pepper and red pepper flakes. When the pasta is ready, strain and transfer to the skillet with the garlic. Add another ½ cup of white wine to skillet; cook until the wine has been fully absorbed, tossing the spaghetti constantly. Add the cream, the grated cheese; toss to combine. Taste for seasoning and adjust as needed. Use pasta water if too thick: add a little at a time. Finish by adding the crispy pancetta, arugula, and pine nuts and fold to combine. Top with the black olives. 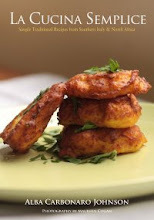 Those who love good food know how to appreciate it, especially in the simplest forms. With just a few easy steps, you can prepare this delicate and elegant recipe. 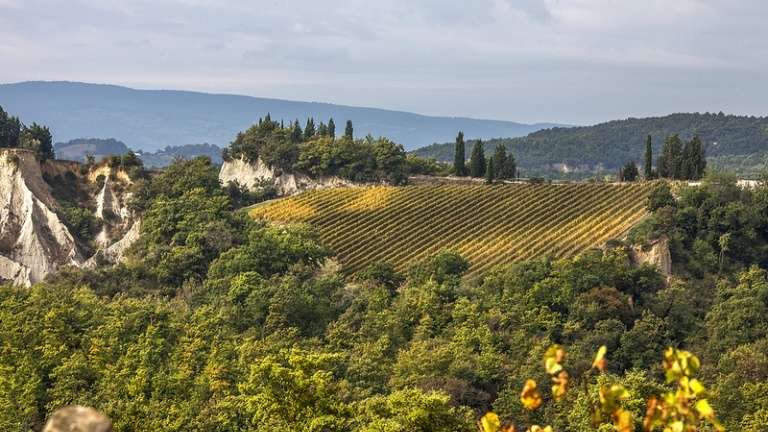 My white wine of choice is the Orvieto White. You can use a Pinot Grigio if you prefer. Dry ingredients: In a large bowl, sift together the flour, baking powder, and salt. 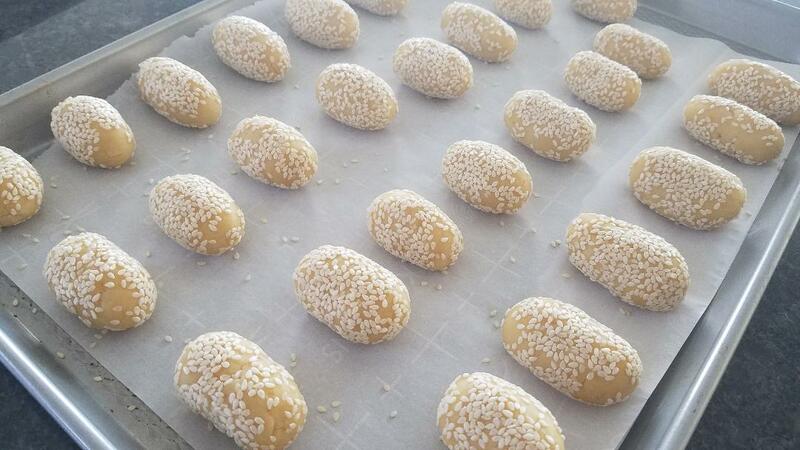 Place the sesame seeds in a plate and roll the cookies into the sesame seeds, pressing them so the seeds stay on. Place the cookies on the baking sheets keeping the cookies 1- 1 ½ inches apart. Bake 20-25 minutes or until lightly browned at the bottom. Cool, and store in airtight containers. Baking time depends on size of cookies. 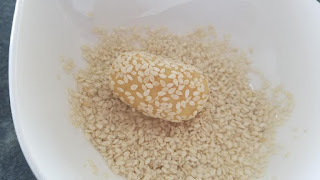 The sesame seeds on cookie should be slightly golden. Makes about 2 dozen depending on size. I have made these cookies before by following a traditional recipe that my mom used to make....they turned out a little too dry for me. So, I experimented with orange zest and juice instead of adding more butter or eggs and they were simply delicious, beautifully scented! These are great dunkers! Growing up my dad would dunk these cookies in red wine, while I would dunk them in my mother’s freshly made lemonade. I still prefer the lemonade. 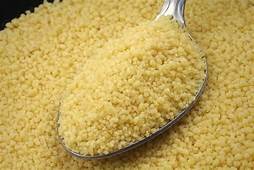 Place the dry couscous in a bowl, and drizzle 1 tablespoon oil on top. Rub the couscous between your hands to coat the couscous with oil. You will know that it is well coated if some pellets stick to your hands. Season with salt and pepper. Run your hands through it one more time to mix well. Pour in the hot water and rosewater; quickly stir with a wooden spoon. Cover the couscous, and let it sit, undisturbed, for at least 10 minutes. Once the couscous is ready, remove the lid, and use a fork to break up and loosen the couscous. Add the melted butter and stir with a wooden spoon until well blended. Gently fold in the raisins, apricots, and dates. 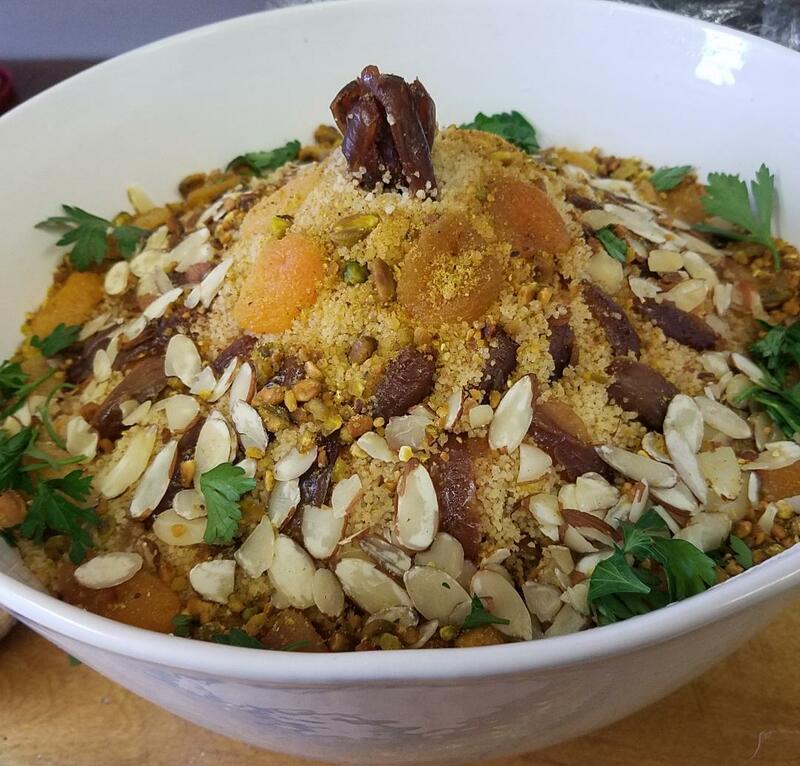 Transfer the couscous to a festive platter and create a mound in the shape of a pyramid. Scatter the toasted almonds around the base of the mound. Sprinkle cinnamon around the mound creating either a stripe or dot pattern. You can also add who dates or apricots around the mound to decorate. Serve at room temperature with a small bowl of light brown sugar on the side for your guests to sprinkle on top. In Maghreb, sometimes couscous is served at the end of the meal as a delicacy called Seffa, which is made with dried fruit, almonds, cinnamon, and brown sugar. 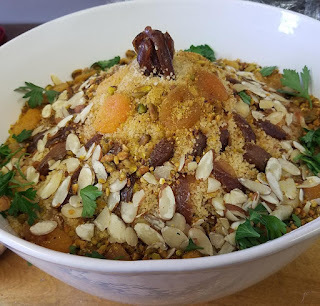 This North African dish is customarily served in large mounds during festive gatherings such as weddings, anniversaries, and other occasions. 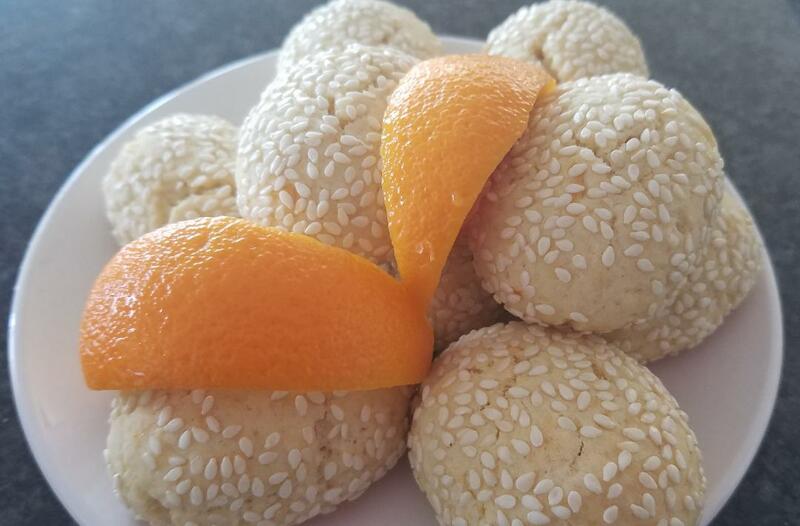 And when a guest comes to your house, Seffa is offered as a symbol of generosity, friendliness, and warmth. In a large bowl add and mix the flour, salt and baking soda together. Make a little well in the center of the bowl. 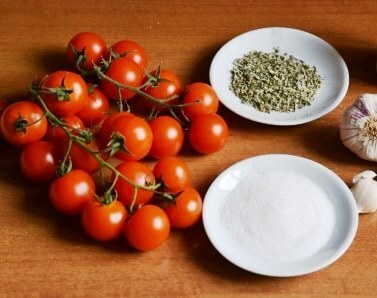 Add remaining ingredients in the center. Incorporate and mix batter until it is homogenized. Knead about 5 minute until the dough is smooth (if the dough is too tough, add a little milk, if it is too soft add a little more flour). Cover with towel in a bowl and allow to rest at least 30 minutes at room temp. Once rested, divide into 8 smaller pieces; roll each piece into thin long logs (thin snakes). 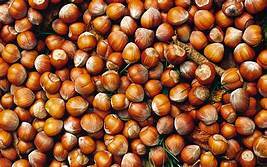 Cut each log into tiny ¼ inch pieces about the size of chick peas. Set on a clean towel to get ready to cook. Prepare a medium size pan half filled with a light vegetable, canola, or safflower oil. When hot, add a batch of struffoli at a time and cook. Stir continuously and cook until just golden (not brown). Transfer cooked struffoli to paper towel to drain the excess oil. Continue this process until all the struffoli have been cooked. 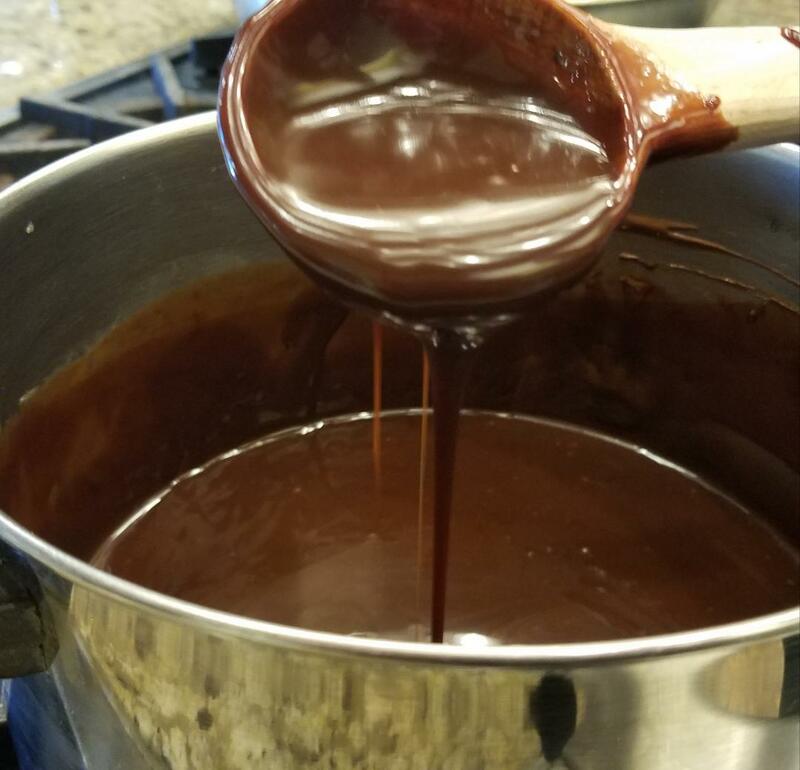 In a wide pan, heat the honey on medium-low heat about 3 minutes. Turn off heat; add the cooked struffoli. Mix well and uniformly. Transfer the struffoli to a dish and shape like a wreath or small Christmas tree. Decorate lightly with sprinkles. Allow to rest about an hour before serving. 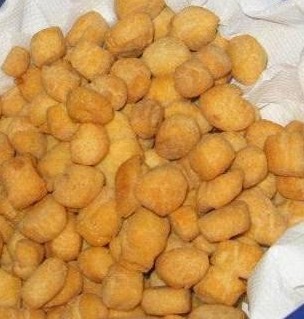 Struffoli are sweet morsels of delicious tiny dough balls that are first fried and then dipped in warm honey. 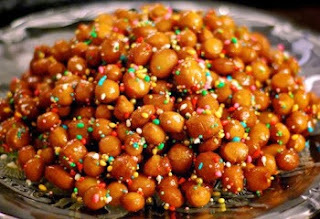 It is a traditional dessert in the Campania region of Italy which is served for Christmas Eve or Christmas day. Struffoli are decorated with colored sprinkles, candied fruit, and even coated almonds. They can be prepared in advance. I usually prepare them a few days before Christmas. There are a few variations of this recipe depending of where you live. 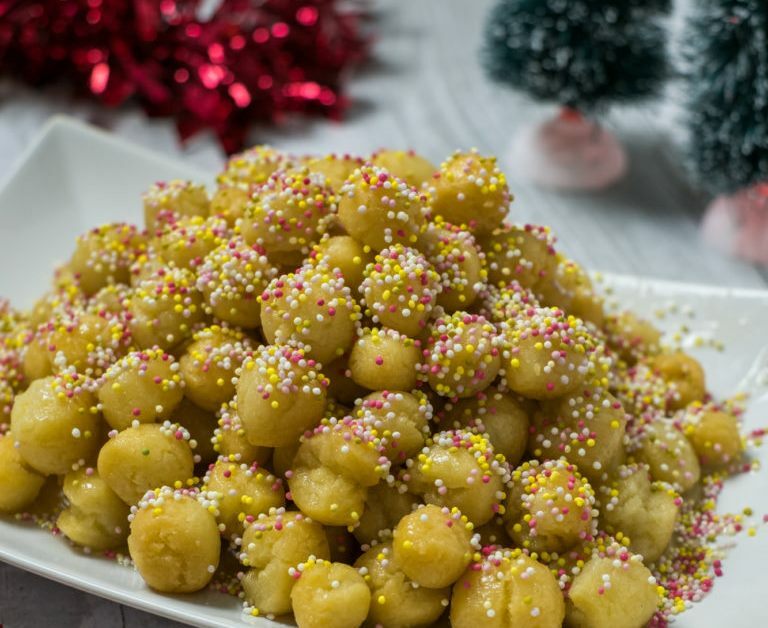 Even though struffoli are served at Christmas, there is no rule in America, so you could make them for any special occasion and watch them go swiftly! Warm the milk on low heat; add the coffee granules and mix well to dissolve. It takes 1-2 minutes to dissolve. Set aside and cool. Separate yolks from whites in bowls. Bowl 1: combine yolks and sugar; mix well. Sift in the flour, baking powder, and baking soda. Mix well. Begin adding the milk and coffee a little at a time and mix well until well homogenized. When it’s nicely mixed, add a pinch of salt and mix again. Set aside. Bowl 2: In a dry bowl, whip egg whites until a firm stiff cloud. Transfer egg whites into flour mixture and fold gently to incorporate fully. Cover in plastic wrap and allow to rest in refrigerator about 20-30 minutes. Cooking: Once the batter has rested, begin cooking pancakes in large skillet. Add a little butter (1/2 - 1 tablespoon) at a time in skillet; ladle small scoops of batter in the hot skillet. Cook 2-3 minutes per side, flipping once. Transfer to a platter or serving plates. In a saucepan place the Nutella and cream on low heat to warm. Keep stirring on low heat, until a smooth homogeneous cream. When the pancakes are ready, drizzle the warm sauce over pancakes. Makes 12-24 pancakes. 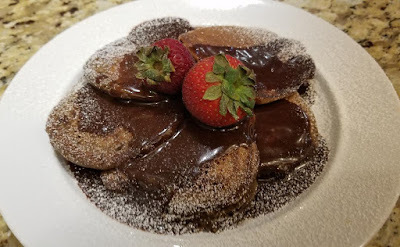 These espresso pancakes are ready quickly and they can be served for breakfast, brunch, or even as a dessert. In this recipe, the pancake mix is enriched by the espresso granules that are dissolved in the milk. Add more granules if you like more espresso flavor. However, the enchanting finish to this recipe is the magnificent delicious warm Nutella sauce over these light and fluffy pancakes. Place the strained spinach in a dry skillet and cook until the spinach is completely dry. In a large bowl, mix together the spinach, feta, ricotta, eggs, black pepper, red pepper flakes, nutmeg, and dill. Lay the pastry sheets lengthwise on a baking sheet. Open the sheets only when you are ready to use them and cover the rest with a damp towel so that they don’t dry out. Each time you pull out 1 sheet, cover the rest with this damp towel. 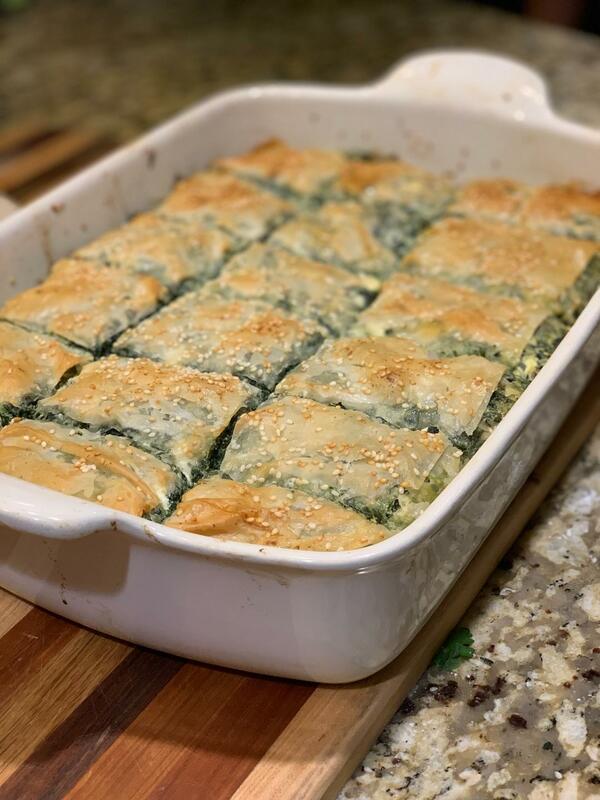 If a phyllo sheet breaks, use it by patching it together on the baking pan and brush butter on it quickly. I usually pat the butter on with a brush, rather than brushing it, it’s easier and the sheets will not break. Melt the butter in a small saucepan and begin the layering process. First brush some butter on the bottom of a 9×13 baking pan. Place one single sheet of phyllo in the baking pan; brush butter on this first layer. Repeat this process for the next seven sheets of phyllo. 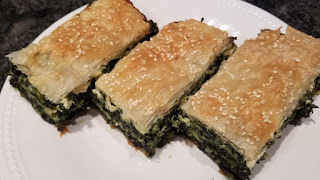 After the eight layers of phyllo, add half of the spinach mixture spreading it evenly with a spoon, or your hands. Add eight more sheets of phyllo while buttering between every layer again. Add the remaining half of the spinach mixture spreading it evenly. Top with another eight sheets of phyllo, and repeat the buttering process for each sheet. Brush the top of the last layer in the baking pan with the butter. 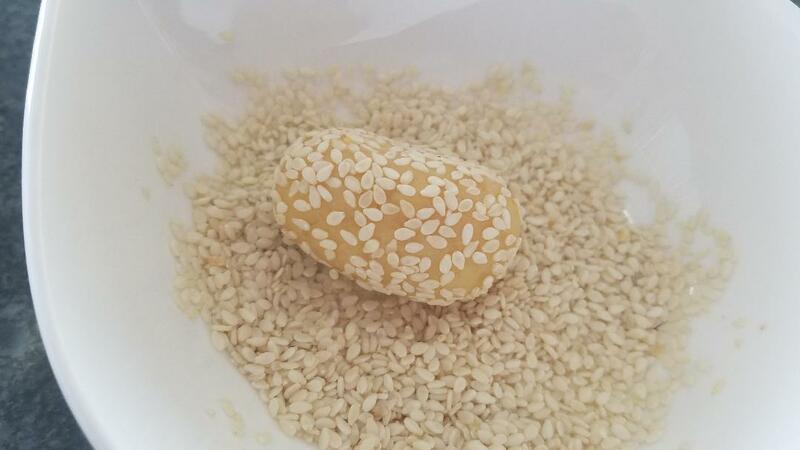 Sprinkle raw sesame seeds, cut in squares. Bake about 45 minutes, or until the top is a beautiful golden color. Allow to cool about 5-8 minutes before serving. The Spanakopita (Spinach feta pie) is a typical Greek Cuisine Dish consisting of a treasure trove of layers of buttered phyllo dough with a filling of spinach, feta, onion, and eggs. 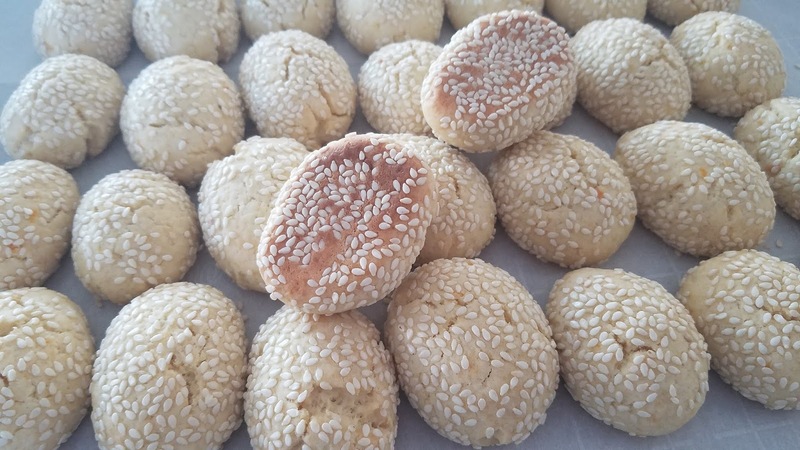 It is prepared in a single mold and then served in small squares or prepared by rolling the filling in individual portions of triangular shape. I have created my version of this dish in my recent cooking class at Whole Foods, by adding strained ricotta, nutmeg, red pepper flakes, fresh dill, and sesame seeds. I lean toward a spicier version. I promise it’s not a lot of work if you are well organized.and have all ingredients ready to go. It will keep in the refrigerator for a few days. To heat, place in the oven over 400 F, and heat for a few minutes. Do not microwave or you could lose the crispiness. In a bowl, add the cucumber, feta, season with salt and peppers. Add the yogurt, herb, and lemon juice to taste. Mix well, taste and adjust seasoning as needed. Add a drizzle of olive oil and taste again. Refrigerate. 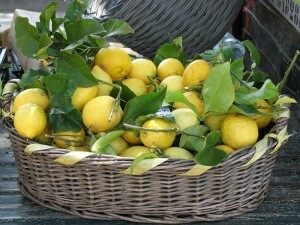 With a small paring knife remove pulp of the lemons being careful not to remove the white part of the lemon. Fill the lemons with the cold mixture. Add a pinch or two of the fresh herb on top, a drizzle of olive oil and serve. No need for fancy containers, lemons make a great presentation when stuffed with this recipe, shrimp, crab, egg or tuna salad. 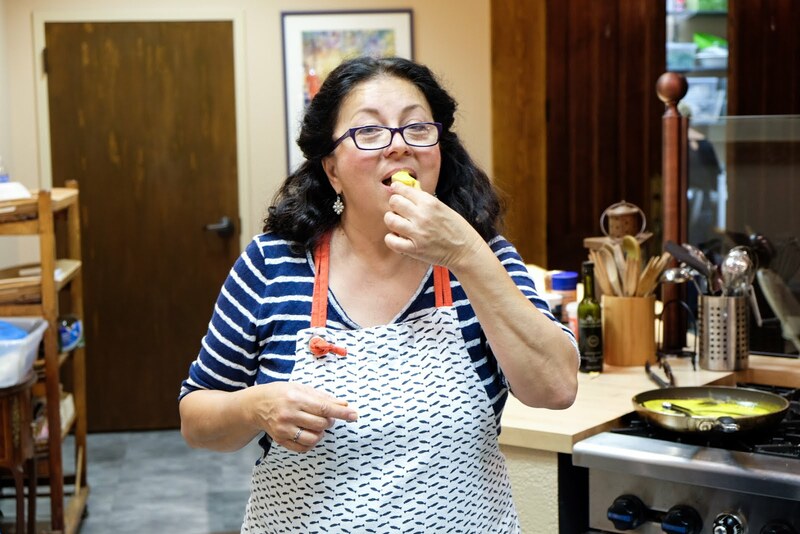 Stuffed lemons can be made ahead and refrigerated. Drizzle the olive oil right before serving, and top with fresh herb or toasted crumbled nuts on top. Enjoy!!! Clean and de-beard the mussels in cold running water. Make sure all the mussels are firmly closed. If any remain open, give them a firm tap. If they close you can cook them. If they stay open, discard them. Also discard any mussels that are broken, for food safety. In a small bowl, add the softened butter, garlic, chive, salt, pepper and red pepper flakes. Fold to mix into a smooth creamy consistency. In a large deep pan, add the mussels and cook covered on high heat about 5 minutes, or until they have opened. Add the wine and ½ of the butter mixture; mix well and cover and cook for 2-3 minutes. Remove lid and discard any mussels that have not opened. 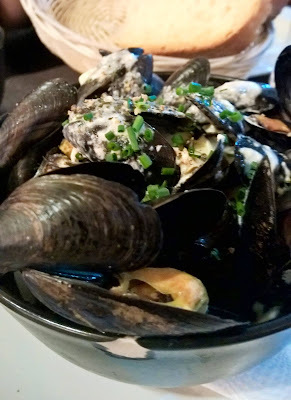 Quickly transfer the mussels in a serving bowl, add the remaining butter mixture on top and serve. Crusty bread is delicious to dip in the sauce. Mussels in butter and garlic sauce are absolutely French. In North Africa, my mom would make this dish on a Friday nights, when we could not have meat. 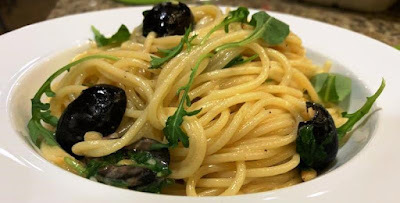 Although not my favorite, she also made this same sauce with escargot. 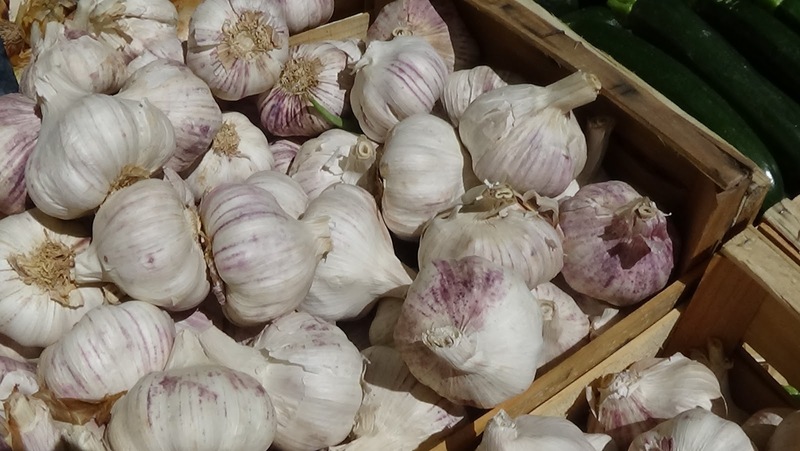 This sauce is bursting with flavor with the slightly sweetness of butter, the fragrant garlic, and notes of dry white wine. A simple dish, c’est magnifique!!! 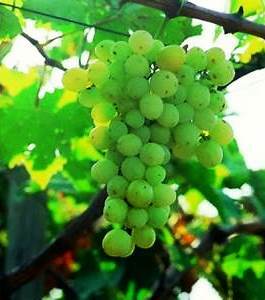 Remove the grape leaves from the jar. Arrange them so they are not stacked on top of each other. Alternate position with leaves so that when you place them in the pan they are loose and they will cook evenly. Bring a medium saucepan of water to a boil. Add the grape leaves; blanch for 30 seconds and drain. Throw the water away and add fresh water to the pan. Blanch the leaves a second time in boiling water. Drain again. Gently spread the leaves on a work surface over a kitchen towel, vein side up to cool. . Pat dry and cut off stems. Heat a stovetop grill on medium. In a shallow dish, combine the thyme, rosemary, goat cheese, and pepper; combine. Take a tablespoon of mixture and roll into a small log. 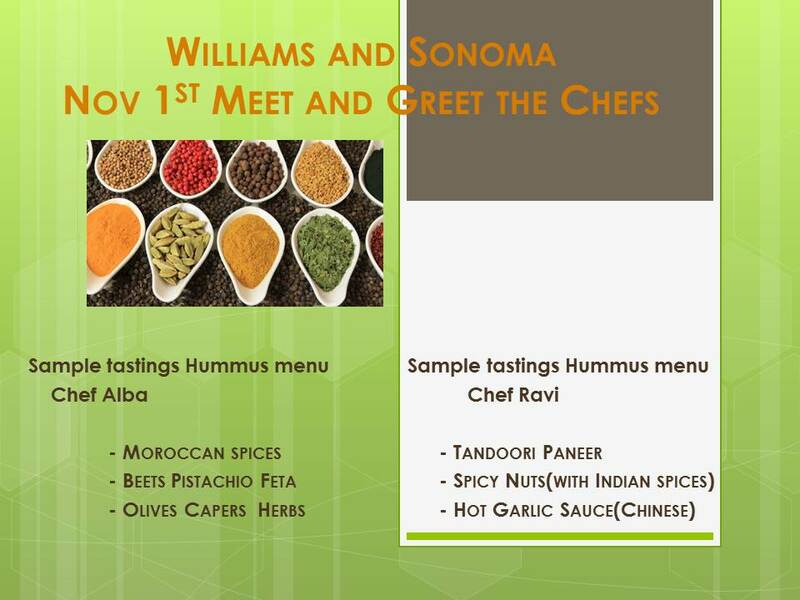 Coat logs with chopped almonds and set in the center of each grape leaf. Remember the rough side is where the stuffing goes; shiny side is on the outside for grilling. Drizzle each leave with a thread of olive oil and then begin to wrap them into a log. 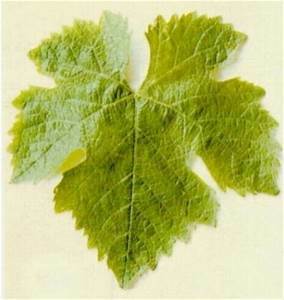 Lightly brush the outside of grape leaf packages with olive oil. Grill each one about two minutes per side. The leaves should be crispy on the outside and the cheese slightly melted on the inside. When ready, drizzle some balsamic vinegar on top and serve with a yogurt or tahini sauce. I love the traditional Greek rice and meat stuffed grape leaves, they are usually served as a meze. They are delicious yet a little more time consuming. I wanted to see how they would taste if I grilled them. Then I took another short cut and used cheese, almonds and so herbs without worrying about cooking the stuffing. I have made them in several cooking classes and they have been well received. Give it a try, fill them will other cheeses if you like. Cut/shave the dry bottoms of the asparagus. 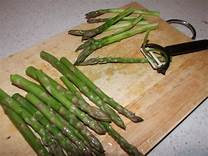 Place them in a pan with boiling salted water; cook until very al dente. Do not overcook. Strain and cool in ice water. Strain again and pat dry. Preheat oven to 400F. Line a baking sheet with parchment paper and butter the paper. Sprinkle some grated cheese on the top. 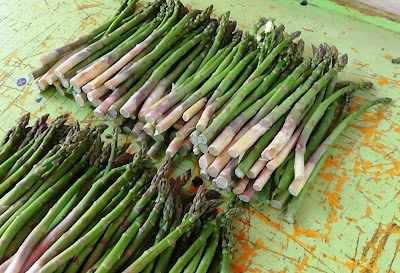 When the asparagus are cooked and dry, place them on the buttered baking sheet. Melt the butter in a heavy-bottomed saucepan on medium-low heat. Stir in the flour and cook, stirring constantly, until the paste cooks and bubbles a bit, but don't let it brown, about 2 minutes. It should be slightly golden and aromatic. Add the warm milk in two batches, continuing to stir as the sauce thickens. Bring it to a slight bubble. Add salt, pepper, and nutmeg to taste, lower the heat, and cook, stirring for 2 to 3 minutes more. Remove from the heat. Add the shredded Asiago cheese, and ½ cup grated cheese; stir until well combined. Add the crab and gently fold. Transfer the sauce on top of the asparagus. 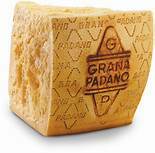 Sprinkle remaining ½ cup of grated cheese on top and bake about 10 minutes or until the cheese has melted to a golden color. Serve warm. 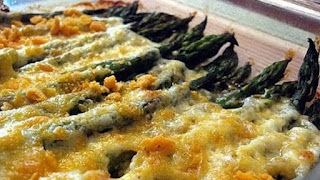 Asparagus one of my favorite vegetables, crab one of my favorite seafood, and cheese a favorite ingredient that I could eat for breakfast, lunch or dinner. How lucky am I to have all three ingredients that I love in one dish? This may seem like a delicate recipe to make, however it is simple and easy to prepare. Don't let the béchamel sauce fool you, if you read my recipe or watch a video on line, you will see how easy it is to make. Once you’ve made the béchamel, it can be used for lots and lots of recipes. So give it a try!!! Preheat the oven to 375°F. Generously butter six 5-ounce ramekins. Melt the butter in a medium-size saucepan over medium to medium-low heat. Add the flour and whisk in the saucepan for 3-4 minutes, until you begin to smell the cooked butter and flour or see a slight change it color (more beige). Slowly and in batches, add the milk, whisking constantly each time; cook, stirring until it thickens, about 3-4 minutes. Cool slightly so we don’t scramble the eggs when they go in. In a bowl, transfer the béchamel and add the beaten eggs; whisk whisk whisk! Add the Parmigiano cheese, season with pinch of salt and pepper, and nutmeg; stir until well mixed. Divide and pour the mixture into the 6 prepared buttered ramekins. Place in a baking dish. Pour in enough boiling water to come 1 inch up the sides of the ramekins. Bake until the flans are puffed and slightly firm to the touch; 30-45 minutes. The flan mixture should jiggle slightly when moved. Remove the ramekins from the water bath. Let the flan rest for 15 minutes before you cut and serve. When the flans have rested, gently run a small knife around the edges and remove the flans from the ramekins to serve in the center of each plate. Or... you can serve them right in the ramekins, which would be ok. 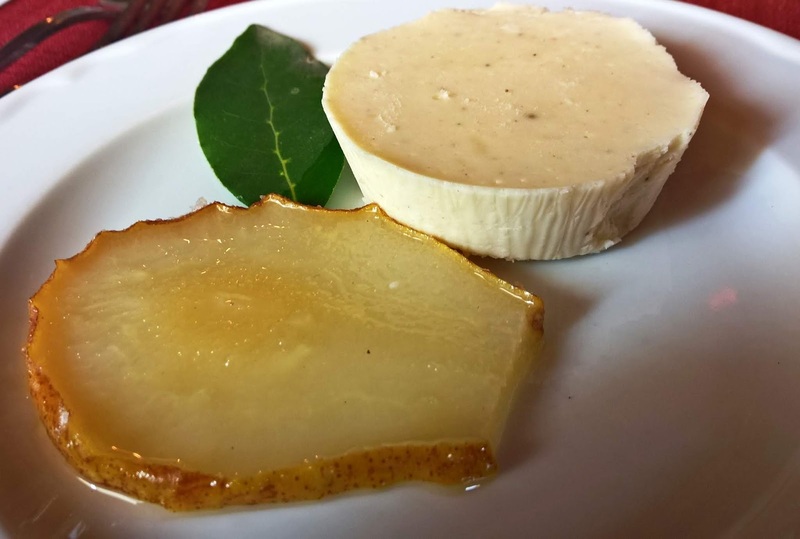 This comforting Italian cheese flan makes an impressive appetizer or side for your guest. I love the silky creaminess of a flan and I love cheese, together they are so pleasing on the tongue. 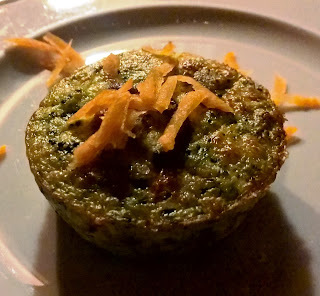 For years, I have made savory versions of flans which are very popular in Italian cuisine, such as spinach, artichoke, zucchini flowers, and more. 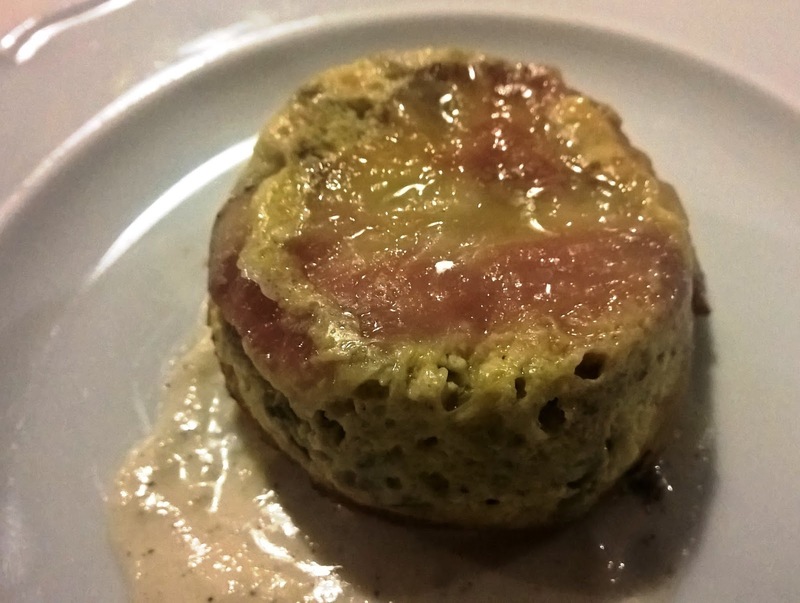 This custard-like dish partners perfectly with any poached or grilled fruit, fish, seafood, or vegetables. It’s very easy to do. When I make it, I like to serve it with crusty bread until it’s all gone!!! 1. Cut the tomatoes in half. Place them on a parchment paper lined baking sheet. 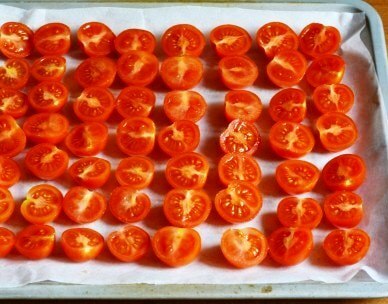 The tomatoes must not overlap and the cut side should be upwards. 2. In a small bowl, add and mix the sugar, minced garlic, lemon zest, and thyme leaves. Sprinkle this mix evenly on the tomatoes. 3. Lightly sprinkle salt over each tomato slice, followed by cracked black pepper. Lastly drizzle the tomatoes with a generous amount of good extra virgin olive oil. 4. Bake at 225 °F for about 2 hours, or even better at 200 °F for 3 hours (low and slow). 5. Cool and place in a glass jar with more oil to preserve for a few weeks. · Can you think of other uses????? Ethereal theme. Theme images by ArdenSt. Powered by Blogger.